Ok I am a technophobe and I'm a little bit fascinated by all these mod cons, kindles, i phones, blackberrys, magic sticks (the gizmo you stick in your computer that remembers stuff), excel, harddrives, floppy discs, I could go on... I generally get lost when people start using new technology terms- I did once call the IT department to tell them my puter wasn't working to find it wasn't plugged in (pesky cleaners). and I often wonder why all these new gadgets have silly little names. So if you where bright enough to invent something what would you invent and what would you call it? And can anyone tell me the new stuff I should know but more than likely don't? The Interchop. A guillotine-like device that will actually chop your fingers off if you're still typing away at the internet when you should be in the gym. A chicken that produces yoke-less eggs just for Bahtatboy. 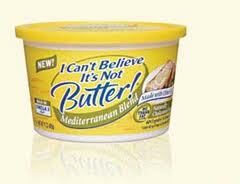 Something that is exactly like butter, but healthier!! Well Kitty I’m glad you asked that. I would complete the dream of the astonishing Nikola Tesla by creating a wireless power system that was free for all to use (Original idea: http://amasci.com/tesla/tmistk.html). Free 100% reliable electricity, everywhere and always. It’s such a PITA that everything but power can be transmitted wirelessly, electricity needs updating. Of course there are other things like perpetual motion, cold fusion...but they are too unrealistic for now. 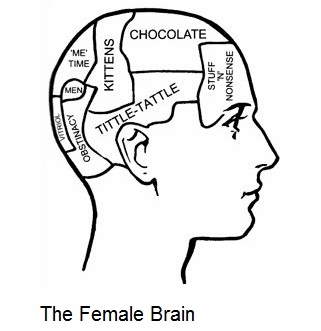 A guide to womens' brains. PS The electric jam would be so that I could re-charge my iPod whilst eating breakfast. 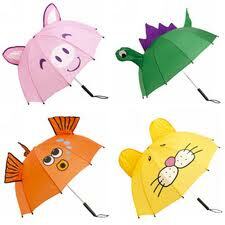 I think you'd get on well with Umbrella-man. Something that does away with that spaghetti mess of cables behind my tv. I've tried the 1" wide corrugated conduit thingies, but still you end up with a load of wire at one end or 'tother, plus the intereference caused by the power cables. Is there a simpler way? Or The Instasnip, if you will. A system integrated into the interweb which delivers 30,000 volts directly through the keyboard for inappropriate usage of were/where/we're and other similar "Eats, shoots and leaves" type mistakes. Though the attempt to use the subjunctive is to be applauded.